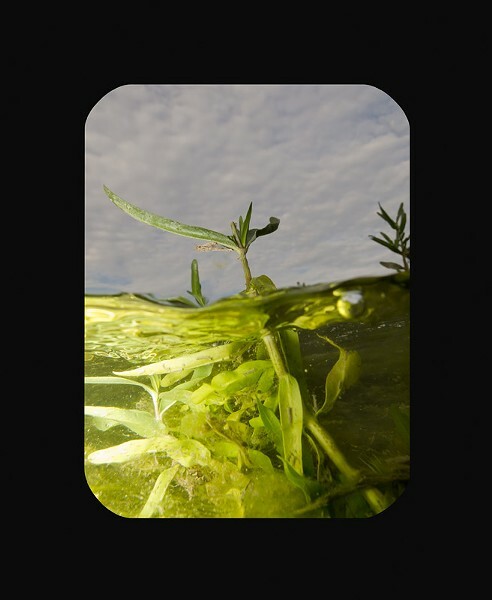 ART REVIEW: "Robin Germany: Watermark"
PHOTO PROVIDED One of Robin Germany's images from "Watermark," an exhibition exploring the diverse spaces above and below water boundaries, currently up at University of Rochester's Hartnett Gallery. Through November 4Hartnett Gallery, Wilson Commons, University of Rochester River Campus275-4188, blogs.rochester.edu/hartnett/Tuesday-Friday 11 a.m.-7 p.m., Saturday-Sunday noon-5 p.m.
We are too tied to our own immediacy. That is the whisper that wafts off the work of Robin Germany, which is currently showing in an exhibit entitled "Watermark" at Hartnett Gallery at the University of Rochester. Full of quiet wonder and reverence, Germany's images display the hidden minutiae just beyond the threshold of the surfaces of various bodies of water. What she finds there are unexpected, complex worlds of beauty, and the encounters give us ample reason to pause and reconsider quite a bit. Once people realized that even a single drop of water is teeming with microcosmic life, humans began to grasp the truly unknowable scope of existence. But to fully explore it, we need to go beyond our basic senses, and expand our intellectual curiosity. Germany's work alludes to all of this, but her approach to the discussion is far simpler, more accessible, and utterly lovely. A dozen large inkjet prints on paper are held on the walls with simple magnets, each a glimpse into a diverse little world of thriving ecosystems, some with out-of-place objects that hint at the nearby and encroaching presence of humanity. One example of the latter is "Playa Lake: Bicycle Tire," in which the curve of the object poking from the murky water looks positively reptilian. "When I slip my camera under the water I am amazed and often surprised by what I see," says the artist and professor of photography at Texas Tech University in Lubbock, via provided statement. "This unknown world is full of creatures, seen and unseen, engaging in processes that I scarcely understand, twisted plants that may belie the quiet world above and detritus of the neighboring world that has blown or washed into the water." The artist "marvels at how disconnected we are" with our neighbors that dwell in what might as well be different dimensions. The images reveal many instances of these entirely different environs, just beyond that thin and, according to Germany, "impenetrable barrier" of the waterline. In "Llano River: Water Plant," a thick stalk forms a bridge between the downy, distant cloud world above and the dark, crushingly packed root-and-bubble-filled water world lit from below by Germany's water lamp. In this image, a wave motion is captured at the waterline. In others the line is completely crisp and still. Often, the world above is left in hazy focus as Germany sharpens our awareness of what lies beneath, whether it be murky and mysterious, or completely clear vignettes of algae, seaweed, or carelessly discarded garbage. In "Cado Lake: Complex Moss," Germany reveals three worlds in a move reminiscent of an M.C. Escher print: below the surface and what's above, as reflected on the water, as well as the surface-sitting leaves that dwell directly on the threshold. "Galveston: Translucent Seaplants" shows us a mass of strands that resemble rice noodles, a bubbling surface, and tiny people in the distance enjoying the sunset and beach. The soft, organic forms emerging from a green murkiness in "Holly Lake: Algae Underworld" are shielded from the bright white sky by the thickness of the plant at the water's edge, just as a blanket-like covering of clouds shields us from the ever-burning sun. The utter darkness below is echoed by the pitch beneath the treeline at the left shore. Germany's compositions give us little info at a glance, but the enigmatic, colorful little frames — surrounded in black and giving the effect of peering through a viewfinder — are captivating and filled with details once the viewer becomes engaged. In "Llano River: Yellow Roots" we see a stormy-looking sky through a silhouetted tangle of tree branches, green shoots sprouting from the water, and the lamplit underworld of delicate root systems tangling off into the blackness. "Galveston: Orange with Sargassum" is packed with heavy branches of strange sea plants, the crisp blue sky above separated by a multitude of bubbles along the threshold. A strange, glowing orange orb in middle distance gives the effect of the sun taking a dip, and water droplets on the lens enhance the feeling of being there in the water. Nature is caught attempting to reclaim manufactured oil in "Galveston: Red Bottlecap," in which a red disc bobs in the waves, almost entirely covered with brown algae and moss, thick with strands waving in the clear water. This is perhaps the loneliest image, depicting a relic washed up as if from after our disappearance from this place, and it makes me consider that while individuals and entire species will not survive, the entirety of the global ecosystem is too big to merely disintegrate. Modes of survival end and shift, but the macroorganism of this planet will endure so long as its sun does. Few elements of modern American culture request that we grow thoughtful and change. And fewer sources of those requests know how to do so in an effective way, without alienating an audience. Germany's work, I think, is effective in asking questions about our relationships to the rest of life on Earth, and gently shaming us into seriously considering it. Walking back through the autumnal UR campus along the river, my focus plunged below the gently rippling, mirrored surface, and I found myself pondering mysteries and limitations, and how deeply our actions affect the strangers all around us.